The 2018 Athlete Leadership Program graduating class. 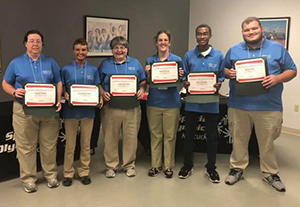 ALP’s provide athletes with opportunities above and beyond competition, to become advocates for themselves, all persons with intellectual disabilities and Special Olympics. Athlete Leaders can become committee members, board members, coaches, volunteers, spokespersons and more! ALP’s give individuals with intellectual disabilities the opportunity to stand up and let their voices be heard, as well as teach them the leadership skills that will help them in all facets of their life. Once their training is complete, athletes could have the opportunity to hold positions of leadership and influence. To empower athletes to develop leadership skills and to take on leadership roles. Athletes are encouraged to utilize their voices to bring awareness to their abilities, the abilities of persons with intellectual disabilities and awareness of Special Olympics. Athlete Leadership opportunities help build athlete’s confidence and help create and encourage inclusive communities. Annually a group of athletes enroll in the Athlete Leadership Class – this class of athletes will participate in training sessions scheduled throughout the year. The trainings are typically held at the SOKY Office in Frankfort. In these trainings, athletes will learn about becoming Global Messengers and/or an Athlete Ambassador. Global Messengers – this program prepares athletes to become official public speakers for Special Olympics. This program allows athletes to expand their Special Olympics experience beyond the playing field. Athletes will learn about leadership, history of Special Olympics, SOKY facts and statistics, speech writing and of course, how to give a speech. Athlete Ambassadors – athletes attend the same training sessions described above but will receive additional training on simply being an effective program representative. This is ideal for the athlete who has a desire to represent SOKY at the next level but who is not comfortable speaking in front of a large audience. Special Olympics athletes serve on the board of directors. As board members, they are given the opportunity to share their opinions, participate in discussions and are expected to deliver the Athlete Report at each board meeting. Athletes can be assigned to serve on a sport-specific Sport Development Team giving them an opportunity to share ideas and opinions about sports rules and regulations. SDT’s gives athletes a chance to discuss important issues with other athletes and be the voice of the athletes at meetings. Athletes who desire to be a member of a SDT should be proficient with email communication. Athletes who desire to take their sport experience to another level can become coaches and/or sport officials. Athletes who qualify would be required to obtain all levels of training outlined by SOKY for Coach Certification and/or must fulfill all training and education requirements of the sport national governing body for becoming a certified official. For more information, contact Trish Mazzoni at 502-695-8222 or tmazzoni@soky.org.